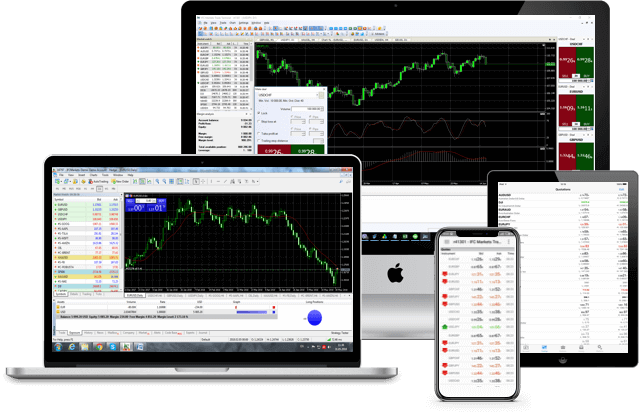 Alongside with the most popular trading platforms MetaTrader 4 and 5, IFC Markets offers you to assess the advantages of its own professional trading terminal NetTradeX. IFC Markets offers you to assess the merits of our own professional NetTradeX trading terminal as well as to compare it with the popular MetaTrader 4 trading terminal. NetTradeX is a free trading platform, designed for CFD and Forex trading. Since its creation in 2006, it has been serving thousands of traders all over the world. The platform is well-known for its reliability, outstanding functionality, user-friendly interface, professional tools for technical analysis and the most important distinctive feature – opportunity to create Personal Composite Instruments (PCI) which is available specifically on NetTradeX. The terminal supports automated trading allowing clients creating experts, indicators and utilities. The platform supports PC, iOS, Android and Windows operating systems, so mobile traders can also take advantage of this professional trading terminal. Traders do not have to open multiple accounts on NetTradeX, since having one account is enough for getting access to both Forex and CFD markets. NetTradeX CFD and Forex trading software supports both market and pending orders, OCO order and server – side Trailing Stop mode, thus, all trading strategies can be implemented on this trading software. The flexible design and professional functional of the platform make the most convenient environment for CFD and Forex trading. Professional traders can create their own instruments through PCI technology, make deep analysis of various instruments, find correlations between them and trade instruments created by them. Due to this unique technology they can get new cross rates, currency indexes, stock portfolios, portfolios for pair trading and many more. All this is available from a single NetTradeX account.